Finally, I have finished this morning the auditing of scores. I haven't checked yet with my sponsors about the email subscription but I have included your points for it if you left a message during the contest period. Before I announce the winners, I would like to say my thank you to all of you. To the sponsors, contestants and my readers who always support and visits my blog. Thank you very much. I have 63 official contestants with an overwhelming 16,065 total points. Here are more of the statistics of my contest. With the statistics below I can say that my second contest is indeed successful. My sponsors would be glad to know that they earned 141 links each for this contest. Let's just see on the coming days or months on its effect on our Page Rank. 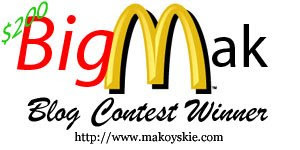 Finally, here are the Grand 5 winners of the Big Mak Blog Contest. To claim your prizes, kindly contact the sponsors directly. Drop me a message for you PayPal email address so I can send your cash prize. Please be nice to the sponsors and say your thank you when you contact them. Visit my other post for the winners of the 10 consolation prize. 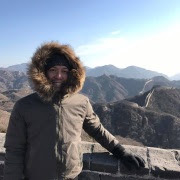 Makoy is a Senior Software Engineer based in Singapore. He enjoys cooking, swimming, running and taking photos. Makoy started blogging way back 1998 during his College years. Aside from his personal blog, he maintains a music blog, an entertainment blog, making money online blog and a photo blog. A certified Filipino blogger that wants to dominate the blogosphere. Congratulations on all the winners and congrats to you Makoy for a successful contest. I saw the consolation prize post so I miss out to see the Grand Prize Winners as I post the comment first to congrats winner there. Now I saw this, I am so thrilled I won! Indeed great contest and I am happy to see effort I do not a waste. My points is 2,105? Hmm.. mas malaki pa score ni pehpot sa kin ah. Hehehe! How you counted ba? Nagkahirap hirap pa naman akong mag dugg, tweet, at make review. Whew! Nagkasakit pa ako. Hahaha! Anyway, thanks for your contest! Congratulations too Pehpot (I hope I got that right)! and to all the winners, congratulations! Ales of retarded notebook asked to collect prize from you. I am s happy for my 10K entrecard credits... whew... Ayan Makoyskie I can put the $5 ad here.. See!?? I told you you gonna win it! Thanks Makoy and thanks to the sponsors. @Webbielady, yeah now I know its me. I have sent Sherry, Rosa and Denis cash prize. I think Sherry is not lucky. She worked hard for the winnings. It's not luck here but hard work. I like the contest policy that the winners really deserve what they get. Makoy, the site Filipino Online Community is Wrong but I googled it. I have found one but the owner seem to not update the blog for quite sometime. Just to make sure, what is the correct link? I am buying the ads on top there so here is the code... i dunno if you can read it but I post it here, just retain the $5. thanks. the tags or alt="webbielady, web learning, online earning, blogging, webbie stuffs, online stuffs"
haha! sabi ko na si Sherry mananalo! Congrats, Sherry! haha, pehpot! kinarir mo tlaga ha. hahaha! @webbielady: kinarir din, hehe! Congrats! next time kakaririn ko na rin hehe! Nita pala yung owner nung fili, andito yung mga blogs na sponsor nya: http://www.makoyskie.com/2009/01/big-mak-blog-contest-need-sponsors.html Look for Nita January 9, 2009 7:42 AM comment. congrats to all winners. your hard work really paid off! More power and congrats again. Makoy, can you list down all entrants ranking and the points earned. I really want to know my points. I think I am not a far away entrant. wow! did not expect to land on second.. I thought I was on third or fourth.. to think I only joined this contest 2 weeks before it was finished..
Actually last night I was excited for the announcement that I F5 the page every now and then.. and when finally you posted the winners, hubby came..which means no more online activities for me(and fedhz can attest to that LOL)..
Yan di tuloy nakatulog kagabi LOL..
hi pehpot, please present your valid ID and receipt to your suking tindahan hehe. send me your paypal email address for you cash prize. CASH PRIZE will be sent to me. For the EC, contact the sponsors. i am also shocked that you went to 2nd place. But your new digg submissions landed you the 2nd spot. Will post the official scores maybe later. Will cook my brunch now. valid ID?!? pede id na bigay sa baggage counter? okidok I will contatc them soon..
manong di ko ma access si nexus..
with the score showing now, we know how we where we gained the points. Wow! These winners won BIG! !